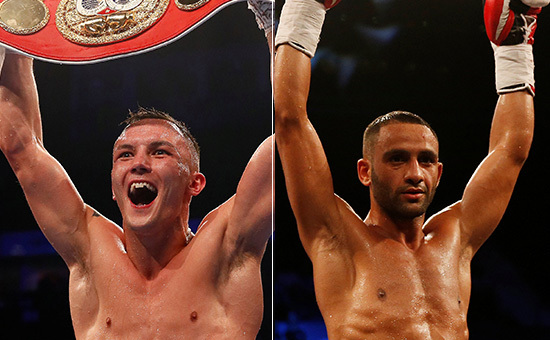 WE NOW HAVE another big night in Leeds to look forward to following the opening of purse bids for the IBF world featherweight title defence between the champion Josh Warrington and his mandatory challenger Kid Galahad. We are happy that our bid to stage the occasion came out on top and it was a case of us backing our man to build on the incredible success he created in 2018 with his memorable wins over Lee Selby and Carl Frampton. It is no secret that Josh’s preference would have been to head straight into a unification battle with one of the other champions, but a mandatory obligation presented itself and it is important for Josh to maintain his status as a world champion. We are in the process of firming up the details for the fight with regard to date and location, but it will obviously take place in Leeds and it is a magnificent opportunity for Josh’s legion of local supporters to once again see him in action on home turf in a Leeds-Sheffield derby encounter. While it is not the unification Josh craves – which will come soon enough – a fight with Galahad will present an intriguing clash of styles and characters. They are both unbeaten (28-0 Josh and 26-0 Galahad) and if Josh manages to repeat the success he enjoyed over Galahad in their amateur days he will well and truly have conquered the domestic scene following his Selby and Frampton heroics last year. 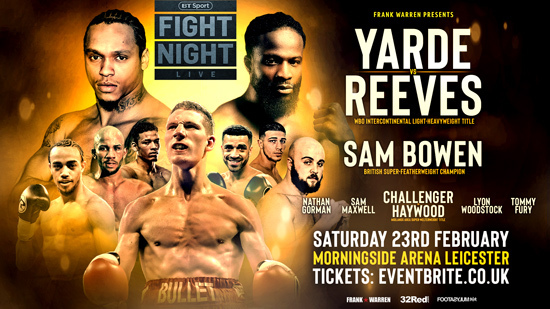 It will be great to return to Leeds for another special night, which will again provide a showcase for other local fighters, and the event information will be posted very soon. WE HAD TO move quickly this week when we received news that Mehdi Amar, who was set to fight Anthony Yarde in Leicester on February 23, had withdrawn due to injury. It is not easy to find opponents ready to go in with Anthony at the best of times, so we had to rapidly pull out all the stops to put a replacement in place and Travis Reeves accepted the challenge. Reeves is somebody we have looked at before for Anthony, he is in a good run of form and has fought at a good level. At this stage of the game it is all about Anthony and his performances. It is important that he goes in there and gets the job done because we are on the cusp of entering a defining period of Anthony’s career. He is ranked No.1 by the WBO and a mandatory challenge will be called before too long, so we need to have Anthony in the optimum position to take advantage of the opportunity. I hold my hands up, I thought Sergey Kovalev was a declining force but he managed to impressively turn the tables of Eleider Alvarez last weekend and will soon be notified by the WBO with regard to the status of his mandatory. It will be a big step for Anthony to take, so we will look at how he shapes up against Travis Reeves and take it from there.